St. Mary’s University has been awarded $2.3 million for a five-year renewal of its federal Maximizing Access to Research Careers grant, which is sponsored by the National Institute of General Medical Sciences. 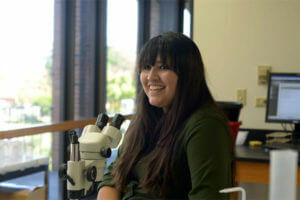 Beginning June 1, the renewal grant will provide $463,566 annually for five years for underrepresented students majoring in Biology, Biochemistry, Biophysics, Chemistry, Environmental Science, Mathematics and Engineering to complete research training and work alongside faculty mentors. Highly qualified students participating in the MARC Undergraduate Student Training in Academic Research (MARC U*STAR) program are provided with academic and research support to prepare them to pursue biomedical and biobehavioral research-related careers by obtaining their Ph.D. or M.D./Ph.D. degrees. The acceptance rate for MARC trainees into graduate programs over the past 10 years is 100 percent. “The MARC trainees will continue to serve as positive role models to their peers and will help to promote a culture of undergraduate research on our campus,” said Timothy Raabe, Ph.D., Associate Dean, Chair and Professor of Biological Sciences, and Director of the MARC U*STAR Program at St. Mary’s. The renewal also includes the creation of a MARC Associates program to extend MARC activities to qualified students with an interest in graduate school. The program will provide resources such as information and application strategies for securing academic-year and summer research opportunities, travel awards to attend professional society conferences to present research, and help establishing networks as students prepare for doctoral study.